This website was developed as a public service to the residents of Export, Delmont, Slickville and the surrounding communities. The station is powered by a Zephyr Instrument PWS1000-TD weather station. The data is collected every 45 seconds and the site is updated every 5 minutes, "live" data is updated every 60 seconds. This sites data is collected using Cumulus software. The station is comprised of an anemometer, a rain gauge and a thermo-hydro sensor situated in optimal positions for highest accuracy possible. We have recently added a Boltek Storm Tracker lightning detector with near real time maps showing lightning strikes up to 750 miles away from the Export area. We share our data with NOAA, NOSA, The Citizens Weather Observer Program, Wunderground, Weather Bug, The University of Utah MESOWest, PWS Weather, KDKA and many other orgizanitions. This site also hosts an ADS-B receiver for FlightRadar24© providing real-time aircraft tracking data 24x7. Export is loacted in the Turtle Creek Valley on old US Route 22 near Murrysville in Westmoreland County, Pennsylvania. So named because it was the first town in the region to mine coal for distant markets. 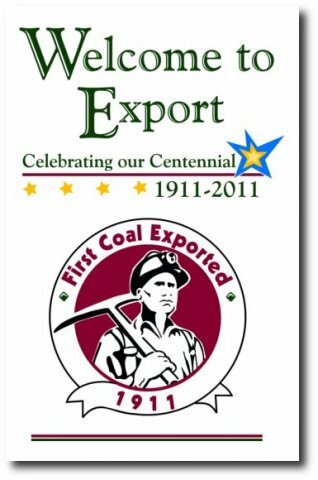 On August 6th 2011 Export Borough celebrated its centennial.